Mayureshwar Temple, one of the eight Ashtavinayak Temples in Maharashtra, lies beside the Karha River in Morgaon village about 64 km south-east of Pune, en-route to Aurangabad in Maharashtra. One of the most important Ashta Vinayaka Temples dedicated to Ganapathi, Morgaon Moreshwar Temple enshrines the idol of Moreshwar, a swayambhu (self-incarnated) form of Lord Ganesh. Moreshwar or Mayureshwar is three eyed and is depicted in sitting posture, facing east with lord’s trunk turning left and fouled with vermillion mixed in oil. It is believed that this layer of vermilion falls down on its own every 100 or 150 years and reveals the actual idol. Diamonds are fixed in the eyes and navel. The fangs of Nagaraja (King of Snakes) are seen on his head. The brass idols of Siddhi (Capability) and Buddhi (Intelligence), who are said to be the consorts of Mayureshwar Vinayak, are to his left and right. Mooshika (Rat) and Mayura (peacock) stand in front of the idol. It is said that the original small idol, made up of atoms of sand, iron and diamonds, was consecrated by Lord Brahma twice. This was supposedly enclosed in a copper sheet by the Pandavas of Mahabharata and placed behind the idol which is now worshiped. The idol of ‘Nagnabhairava’ on the left side of the main deity is worshipped first and offered with coconut and jaggery before worshipping Mayureshwar Vinayaka. Moregaon Mayureshwar Temple faces towards the north and is in the center of Morgaon village, resembling a small fortress. It comprises a dome, surrounded by a 50 feet high enclosure and decorated with four pillars in each corners and exposes an image of a Mosque when seen from a distance. A big Nandi (Lord Shiva's bull mount), made up of black stone, is sitting in front of main gate and facing towards Mayureshwara. The temple, made up of black-stone during the Bahamani regime, has four gates. In the eastern gate is the idol of Lakshminarayana, a giver of Dharma. In the Southern gate are Goddess Parvati and Shiva Shankar, givers of Artha (desired goals). Rati and Kama (desires/wishes) reside in the western gate. In the northern gate resides Mahivaraha (the god of Earth and Sun combined). In the eight corners of the temple, there are eight statues of Lord Ganesha, called Ekdanta, Mahodar, Gajanana, Lambodar, Mahodara, Vikata, Vignaraja, Dhumravarna and Vakratunda. Morgaon Temple opens daily from 5 AM to 10 PM. Prakshal Puja is the first pooja of the day at 5 AM including the jala abhishek and flower offerings. Shodoshpchar Puja is conducted twice a day at 7 AM and 12 PM. Ganpati Atharvashirsha is recited these times. Panchopchar Puja is performed at 8 PM. The temple closes after the Shejarti at 10 p.m.
Naivedya (Holy Dish) is offered to the deity thrice a day, including, Khichadi (made of Rice) in the morning; full meal with sweets in the afternoon; and milk and rice at night. Ganesha Chaturthi is one of the most popular festivals celebrated here. Other major festivals observed are Bhadrapad Shuddh Chaturthi and Magh Shuddh Chaturthi. Vijaya Dashami is also celebrated with much importance. On the night of Vijayadashmi the idol of Moreshwar is taken in procession around the village. On Magh Shuddh Panchami day, Anna santarpana is observed. During this time, food is collected from every house of the village and the food offering is prepared. This is distributed among all the devotees. Morgaon is about 79 km from Pune via the village Chaufala on the Pune – Solapur National Highway. There are daily buses, trains and flights between Mumbai and Pune. 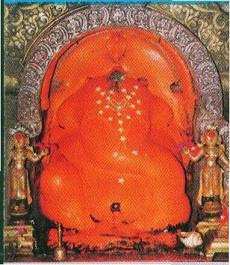 Another route for the Ashtavinayak pilgrims is to go to Jejuri from Pune. Morgaon is about 15 km Jejuri. By this route, the total distance between Pune and Morgaon is only 64 km. Jejuri is the famous pilgrim center of the devotees of Khandoba, a regional Hindu deity worshipped as Martanda Bhairava. Pilgrims coming by train on the Pune – Daund rail route, can get down at Kedgaon. From Kedgaon, one needs to take a bus to Morgaon. Those traveling on the southern rail route, have to get off at the Nira Railway Station and then take a bus from there to Morgaon.